Editor's Note 2005: this technical profile is the earliest written in Australia covering this aircraft, and predates the extensive disclosures made following the aircraft's stunning debut in the Desert Storm campaign. Some minor corrections have been made to reflect current knowledge. The aircraft was replaced by the F-22A Raptor. 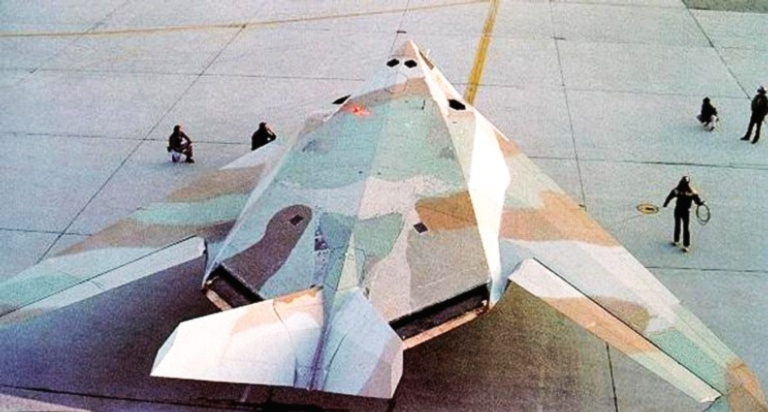 The angular F-117A is without doubt the oddest yet product of Kelly Johnson's Skunk Works. It is however a milestone in tactical air weapon systems design, the full implications of which are still to be demonstrated. Stealth technology is generally the least understood and least appreciated of the newer generation of technologies which are now proliferating. As a result many lay observers have indiscriminately criticised designs such as the F-117 and larger B-2. Under closer analysis however most criticisms demonstrate their irrelevance, and as such in turn demonstrate the questionable credibility of the critics themselves. The F-117A and its newer cousins, the B-2A and A-12A, are strictly functional in design and appearance and all reflect the modern theory of defence penetration. The modern air battle is as much an electronic and optical battle as it is a confrontation between armed aircraft and defences. Virtually every aspect of any individual engagement and any major battle is locked into electronic and optical systems, the radar and optical surveillance, fire control and guidance systems determine largely the capability of any offensive or defensive system. This has understandably led to a situation where a substantial effort is expended on countermeasures and counter-countermeasures. Jammers degrade every sensor and in turn every sensor will be adapted to resist various types of jammer. Some will be more effective, some less in their respective functions. Significantly though, all jamming involves emission of energy to defeat a hostile sensor, be it passive or active. Defeating a particular sensor but revealing your position to another in the process is of questionable usefulness, the proliferation of sensitive Electronic Support Measures and InfraRed Search and Track Systems is slowly but surely increasing the detectability of conventional jammer equipped penetrators. The philosophy of defeating sensors by jamming is itself open to question, as the power of single chip computers and signal processors increases. Many designs are even today so resilient that building effective jammers is difficult with detailed knowledge of the victim system, where that knowledge is absent the task is all the more difficult. Jamming is always most effective where it is specific to a weakness in a victim system, where the victim is reprogrammable by reloading its software the useful life of any countermeasure is very limited. Stealth technology offers another degree of freedom to the weapon system designer. Stealthy airframe and system design vastly reduces the signatures of an aircraft and this in turn reduces detectability while enhancing the effectiveness of those jammers which are usable. Stealth aircraft ideally operate under those conditions where they are difficult to detect and thus do not require the use of jammers, which are a last ditch fallback if cornered. Stealth techniques today concentrate upon the reduction of the radar cross section and infrared emissions of an airframe, as these parameters are critical to the performance of radar and infrared fire control and guidance systems. As is clearly evident from the design of the F-117A and B-2A, the emphasis in both designs is upon defeating microwave radar and shorter wavelength infrared systems, both associated with terminal threats rather than long range surveillance systems. The current generation of stealth aircraft is designed to defeat missile and fighter fire control systems and missile guidance systems above all, this is achieved by reducing the effective range of the sensors used to the point, where they are of questionable tactical usefulness. How this is achieved becomes more evident upon closer examination of a specific design. The F-117A is a large tactical strike aircraft, comparable in size and gross weight to an F-4 Phantom. It has an internal weapon bay large enough to accommodate at least two 2,000 lb bombs and with inflight refuelling has an appreciable tactical radius, as demonstrated by the Nevada to Panama non-stop raid flown during the recent US invasion of that country (US Air Force). 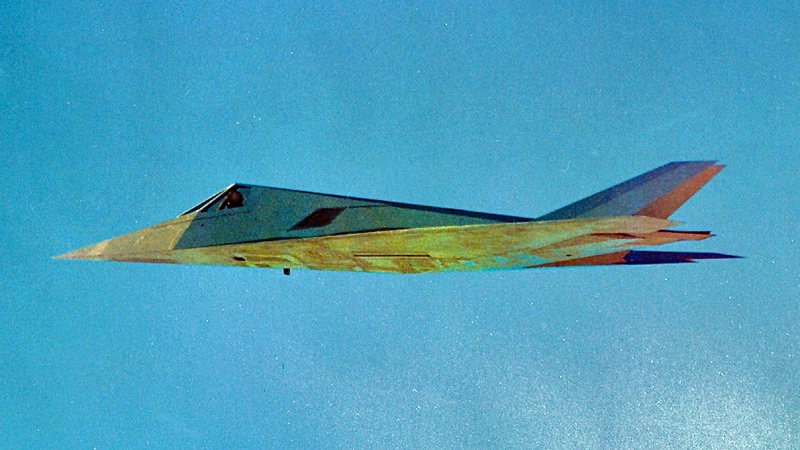 The F-117A traces its origins to the early 1970s, when DARPA took a serious interest in the idea of a tactical aircraft designed for minimal radar cross section (RCS; see TE May 1987). By the mid seventies, five prime contractors were asked to study configurations for a low RCS fighter, Lockheed were apparently excluded due to a lack of recent fighter design experience. Seeing the long term potential of the technology Lockheed expended considerable engineering effort and subsequently approached DARPA to enter the program. DARPA agreed and Lockheed and Northrop were later shortlisted for the Have Blue flying stealth technology demonstrator aircraft program. Lockheed won the $30 million contract for two prototypes. 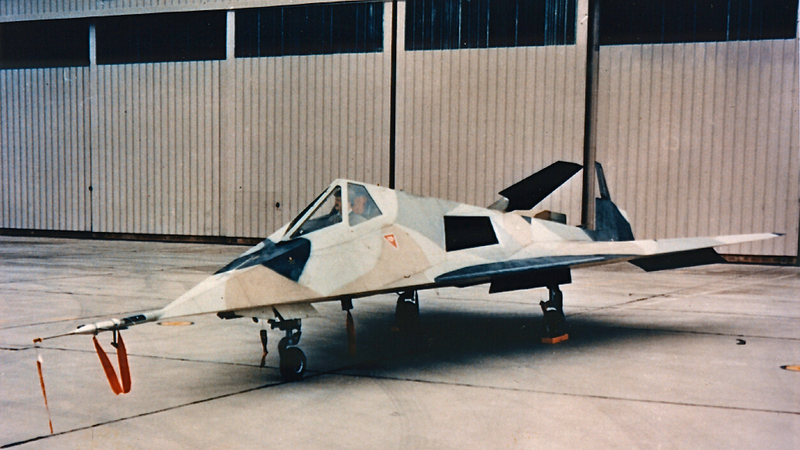 Tests on these two airframes proved that the concept was technically viable and the USAF committed to the design and production of a scaled up F-117 in late 1978. Lockheed's Skunk Works in Burbank, California, were responsible for the aircraft design and lived up to their reputation for fast design cycles at the technological cutting edge. A major factor was the program structure, as TAC sought earliest possible IOC (Initial Operational Capability). The USAF Aeronautical Systems Division at Wright Patterson AFB carried out much of the program management which involved the potentially risky concurrent development/production technique. 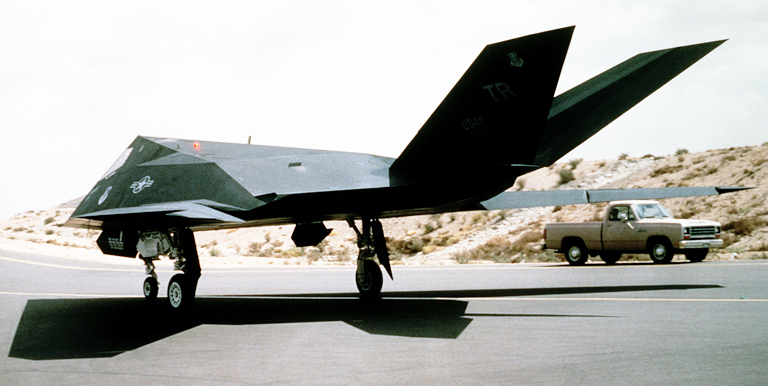 After 31 months of effort the first aircraft flew on the 18th June, 1981, piloted by Lockheed's Hal Farley. It was a very conservative system design using a wide range of then current components and subsystems used in other programs, this was necessary to confine risks to those areas which were new - the stealth features and their aerodynamic side effects. An added benefit was the lesser chance of compromising the then top secret 'black' program by attracting attention to development and production contracts for unique components and subsystems. IOC was achieved in October, 1983, by the 4450th Tactical Air Group based at the secluded Tonopah test range airfield in the Nevada desert. The presence of the aircraft at Tonopah was well known by the mid eighties, however TAC had restricted all operations to night time time only and officially refused to acknowledge the existence of the aircraft. Rumours and conjecture concerning the configuration of the aircraft appeared in almost all trade journals, no doubt encouraged by the USAF who had no interest in revealing the true configuration of the aircraft to the public, and hence also to the PVO and VVS. Some readers may recall the brief program review in TE May 1987, in the light of real hard data the aircraft is actually bigger and more capable than estimated by AA at the time, while using an aerodynamically less effective design strategy than assumed at the time. The USAF contracted for 59 aircraft, the last of which was delivered on the 12th July, this year. The total program cost is US$6.56B of which about US$2B covered development and the remainder production and some facilities costs. The unit flyaway cost is US$42.6M, with a program unit cost of US$111.2M. The difference in these figures illustrates the magnitude of the technology development effort. It is worth noting a Lockheed comment which stated that production rates greater than or equal to 8 units per year maximum during the program would bring the unit flyaway cost down to about US$30M. The USAF, under political pressure over the B-2 program cost, and seeking to integrate the aircraft into regular TAC operations, decided late last year to reveal the aircraft to the public and commence daylight operations. As a result, the 4450th TAG has been redesignated the 37th Tactical Fighter Wing comprising the 415th (Nightstalker), 416th (Ghostrider) Tactical Fighter Squadrons and 417th (Bandit) Tactical Fighter Training Squadron, these units being historically associated with night fighter squadrons. The 37th TFW will relocate to a permanent base at Holloman AFB in New Mexico in early 1992. Logistical support is provided by the Sacramento Air Logistics Center at McClellan AFB and the aircraft are undergoing a planned weapon system improvement program, carried out at the USAF Plant 42 at Palmdale in California. The principal role of the F-117A is precision strike against heavily defended targets. This is achieved by penetration at high subsonic speeds, with navigation assisted by a forward facing FLIR turret hidden beneath a radar reflective cover. Target acquisition, ranging for weapon delivery and tracking/designation during attack is provided by a ventral FLIR/laser turret, visible to the left of the nosewheel. This device has a comparable field of view and function to the Pave Tack carried by the F-111. Note the serrated panel edges about the nav FLIR (US Air Force). 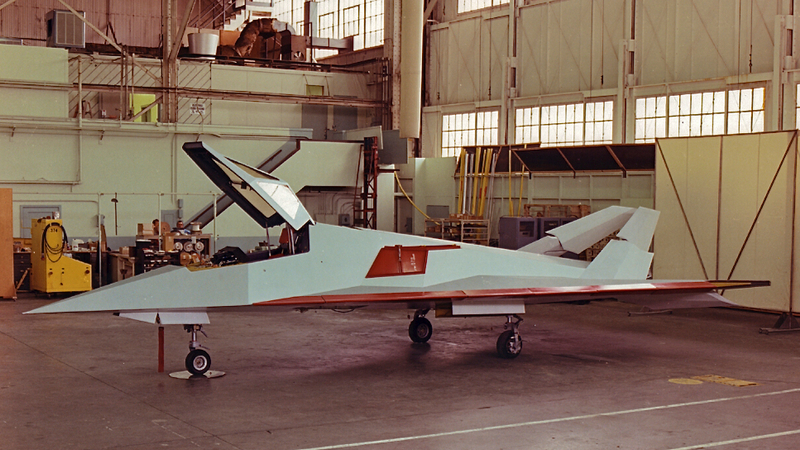 The unique geometry of the F-117A reflects the state of the art in RCS modelling techniques in the late 1970s, in stark contrast to the more refined B-2A geometry. The faceting technique derives from the use of the method of geometrical optics (see  page 114) which essentially says that an impinging ray (beam) is reflected at an angle equal to the incident angle relative to the normal to the reflecting surface (ie shine a torch beam at a mirror and see the effect). For this to be true though the wavelength must be much smaller than the dimensions of the reflecting flat surface and hence it is clear that the F-117A is designed to defeat high to mid band microwave radars. By breaking the area of the airframe into flat facets, the designers sought to reflect impinging radar beams away from the radar. This is also the reason why the external geometry has no curved edges. Straight edges reflect principally in directions given by the above rule, therefore by arranging all areas to be flat and all edges to be straight, the designers could ensure that most impinging microwave energy is reflected away from the aircraft at angles which are determined by the instantaneous orientation of the airframe relative to the searching radar. As the frontal RCS is of greatest importance tactically, the edges and surfaces of the airframe about the frontal aspect are all arranged at shallow angles with respect to an impinging wave. The result is not only a weak radar return but also a continuously scintillating one, scintillation will cause problems in many target tracking systems. In this fashion by clever shaping the RCS of the airframe was dramatically decreased. This alone was however inadequate as other detail contributors to the aircraft's RCS would have dominated the return. Hence the cockpit canopy windows were coated with an electrically conductive layer and the inlets were covered by a fine mesh grill, with holes smaller than the wavelength of the victim radars. Potentially good reflectors such as the engine fan faces and cockpit interior are thus hidden away. Electrical discontinuities associated with panel edges and control surfaces at angles close to normal to frontal aspect beams could also make a measurable contribution to frontal RCS, therefore the canopy edges, weapon bay, undercarriage doors and FLIR bay have serrated edges. The angles used in the detail features are again shallow with respect to frontal aspect beams. Shaping has thus been the principal RCS reduction technique used in the F-117A design. In addition, radar absorbent materials were used for some panels and radar absorbent coating over the area of the aircraft. The RCS of the aircraft has been estimated in the range of 0.001-0.01 square metres, which is incidently between 1% to 10 % of the RCS of a typical chicken  (subsequently released information indicates it to be closer to 0.001-0.0001 m2). The aerodynamic penalties incurred by airframe shaping to minimise RCS have been considerable. Sharp edges and flat surfaces create vortices and thus severely disturb laminar flow causing parasitic drag. The large sweepback angle and low aspect ratio results in a shallower lift-curve slope which forces a higher nose attitude in landing configuration, this is confirmed by the high position of the canopy which in turn incurs an additional drag penalty. Another consequence of this effect is limited lift on takeoff requiring taller undercarriage to facilitate the required AoA on rotation. Highly swept wings are also poor performers at low speed, producing considerable lift induced drag, the F-117A will almost certainly have a narrow range of optimal high subsonic operating speeds where the parasitic and lift induced drag terms appropriately balance. Natural stability and handling characteristics have also been severely compromised by the configuration of the aircraft. The swept wing will cause poor Dutch roll performance and limited control effectiveness, while the beavertail rear fuselage will contribute little to yawing stability. As a result, fly-by-wire control and artificial stability was an absolute must for the design, the system used was derived from the Lear Astronics design fitted to the F-16, quadruply redundant digital with an interface to the navigation system. 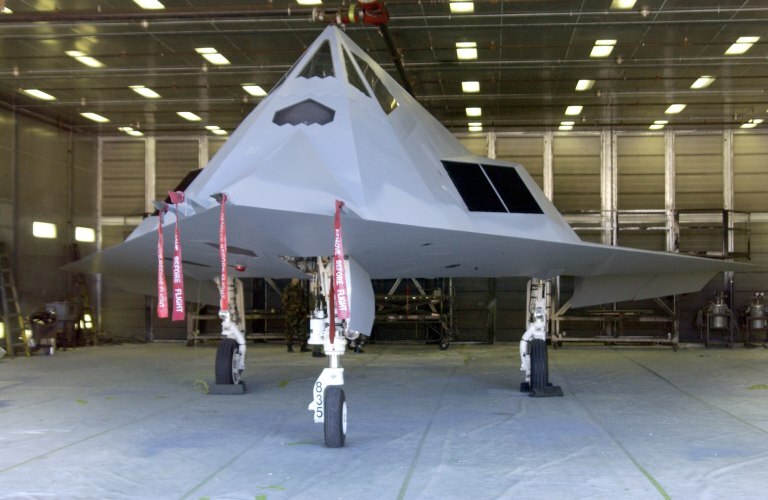 The F-117A uses fully movable V-tail surfaces and split full span trailing edge flaps. It is unclear as to how the surfaces are used, a reasonable guess suggests the tail is used differentially with the wing surfaces used either as dedicated flaps or flaperons. The presence of fly by wire control opens endless possibilities insofar as how the control surfaces are used. The structural design of the airframe is unclear from the available material. It is very likely that the internal weapon bay structure forms a rigid box with structural members running fore and aft to support the tail and nose. The wing spars and engines would attach to this central structure, with radar absorbent external shells or panels fastened on to the structure. The absence of precedents makes any analysis in this area very much guesswork. The aircraft is powered by a pair of non-afterburning F404-GE-F1D1 low bypass ratio turbofans which were developed from the F/A-18 powerplant in early 1980. These powerplants deliver about 11,000 lb of thrust in military power, with a pressure ratio of 25 and SFC around 0.8. How well they perform throttled behind a inlet mesh and constipated by an infrared suppressing exhaust is not clear. The inlet mesh may reduce sensitivity to inlet AoA and sideslip angle, but it is not easy to estimate how well the configuration performs due to the interaction with the wing leading edge which at that point probably functions more like a strake/chine, shedding vortices. Vortex flow has been used in the past to improve the performance of dorsal inlets . The exhaust geometry is typical for a stealth design (cf TE May 87) in that it uses a narrow horizontal slit to confine the infrared radiation pattern of the exhaust into a very narrow range of angles in elevation (ie a beavertail lobe shape). Because of the swept trailing edge of the exhaust, it was necessary to fit vanes to limit radiation to the sides, which also conveniently reduce the azimuth over which the exhaust can be sighted. The cumulative effect of this geometry is to confine the volume of space where the exhaust is directly visible to dead astern and slightly above the aircraft. Even a gentle turn by the F-117A will immediately hide the exhaust from a previously well positioned observer. In practice it means that a short wavelength infrared search and track set cannot lock on to or successfully track the scintillating emissions from the F-117, even from astern. The exhaust geometry of the F-117A is designed to conceal the turbine/tailpipe of the engine from all but a narrow range of angles. The slit aperture flattens the exhaust infrared radiation pattern into a beavertail lobe shape, the vanes in the exhaust narrow the shape of this lobe. A short wavelength infrared device can detect the F-117A only from dead astern and slightly above, and would have great difficulty in maintaining a track (US Air Force). The F-117A designers exploited as much off the shelf technology as practical to reduce design risks and keep costs and design turnaround times down. The aircraft uses an Allied Signal environmental control system adapted from the C-130, Lear flight controls from the F-16, Loral brakes from the F-15, a TAC standard ACES-2 ejection seat common to the F-15, F-16 and A-10, and nav/comm equipment used in other TAC aircraft. US sources indicate that 95% of the ground support equipment used for the aircraft is common to other types, thus facilitating deployments and cutting life cycle/logistical costs. 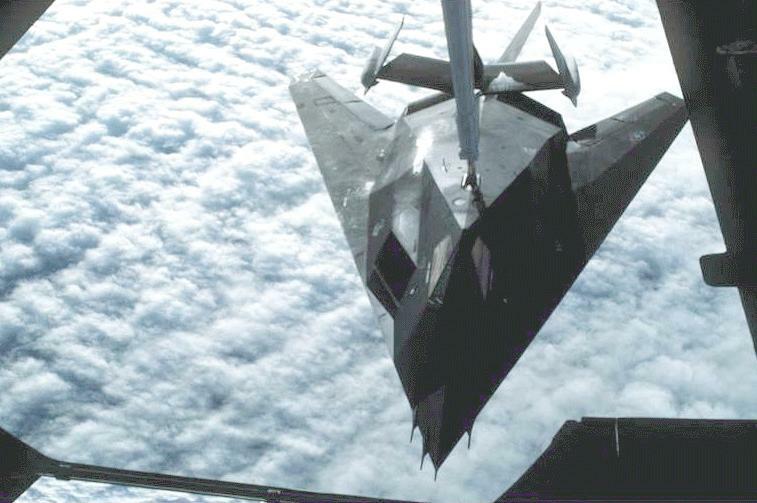 The F-117A employs a navigation FLIR system mounted in a recess below the windshield, a radar reflective cover is used. It is unclear whether additional optical equipment such as low light level TV (LLLTV) is also fitted, the presence of a single visible turret suggests either a single FLIR slaved to the pilot's line of sight and projecting imagery on a helmet mounted sight or a look-into-turn FLIR projecting on the HUD. A fixed forward HUD projection FLIR would not require the kind of bay used. Target acquisition and weapon delivery is carried out with a ventral FLIR/laser turret, to the right of the nose wheel bay. Due to absence of radar for ranging to bomb release, the laser will provide both rangefinding and designation for weapons, its ventral position providing a similar field of view to established FLIR/laser targeting systems such as Pave Tack. The navigation/attack system is fully digital and built around IBM mission computers and MIL-STD-1553B busses, integrated with Honeywell inertial nav equipment. The cockpit employs a Kaiser HUD derived from the F-18's AVQ-28, Honeywell colour MultiFunction Displays coupled to a Harris digital tactical (moving map) display system. The USAF has revealed the existence of a ground based automated mission planning system which would if typical use a groundbased computer, graphics consoles and the aircraft's Delco 1553 bussed cartridge tape system for uploading mission particulars into the nav/attack system. Flight instrumentation includes a Honeywell radar altimeter and air data computer. The USAF have stated that the aircraft is typically armed with a pair of 2,000 lb laser guided bombs, and that the full range of tactical fighter ordnance may be carried. A weapon bay size of 15.5 ft x 5.75 ft provides comfortable stowage for a pair of Mk.84 retarded or laser guided 2000 lb bombs with folded wings (cf. TE May 87), a pair of AGM-65 Maverick missiles, a pair of AGM-88 HARM antiradiation missiles (since confirmed by the USAF) or a pair of CBUs. These would all be typical weapons for the precision strike and defence suppression role performed by the aircraft. The USAF have also stated that the aircraft has a self-defensive capability, although no specifics were released. It is likely that Sidewinders are carried on a retractable weapon bay launch rail. Nothing has been stated by the USAF or Lockheed on the aircraft's defensive avionic suite. It can be safely assumed that a capable RHAW/ESM is carried with enough sensitivity to allow the pilot to avoid or attack air defence radars as required. The aircraft will also carry a trackbreaker ECM system to defeat close-in terminal threats, although this equipment would be used only if absolutely necessary. Concealment would be preferred to deafening the opponent's radars. The performance of the aircraft is a well kept secret. With a length of 65.9 ft and span of 43.3 ft weighing in at 52,500 lb MTOW the F-117A is about the size and weight of an F-4 Phantom. Assuming an empty weight of about 33,000 lb, a weapon load of 5,000 lb, this yields a fuel capacity of about 15,000 lb and hence a combat weight of about 45,000 lb. With 22-24,000 lb of installed thrust this yields a combat thrust/weight ratio of about 0.5 which is at the least not spectacular, but again compares closely to the F-4 on dry thrust. Maximum speed is apparently mildly supersonic although in practical situations the aircraft would operate at high subsonic speeds. Radius performance is also unknown given the unusual aerodynamics, but the aircraft is fitted with a refuelling receptacle on its upper fuselage. The performance of the F-117A is clearly typical for a sixties/seventies tactical strike aircraft, it is in hindsight curious that the USAF had chosen much like with the F-111 an F-series designation rather than a more appropriate A-series number. 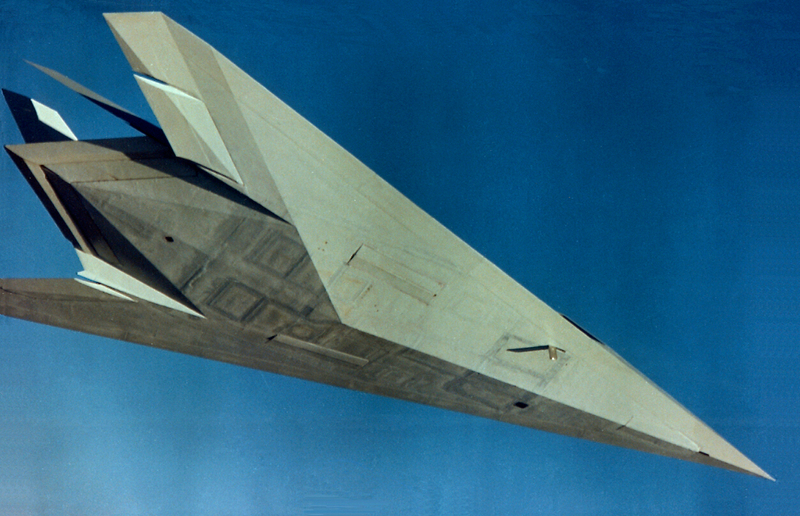 The unusual faceted geometry of the F-117A airframe is designed to scatter impinging microwave energy in any direction but that from where the energy arrived from. In addition, panel boundaries and surface details which could reflect toward the front of the aircraft are serrated to scatter energy to the sides of the aircraft. The engine inlets are covered with reflective mesh to hide the fan/compressor face and the cockpit canopy is plated with a conductive layer to hide the cockpit interior. The result is a radar cross section quoted at 1-10% the size of a medium sized bird (US Air Force). The F-117A is tasked with precision strike against high value targets in dense threat environments. In practical terms this translates into attacks upon C3 (command/communications/control) facilities such as command posts, communications relay centres, critical fuel or munition dumps, airfields and parked aircraft. Other items in this category include air defence radars and their associated command posts (the aircraft was used during the Gulf War primarily for this purpose). The USAF have been less open with specifics on how such missions would be flown. Established doctrine, the suggested RCS performance of the aircraft and observations of its flying activity in Nevada suggest that the style of missions will differ little from those flown by the F-111, ie hostile airspace is penetrated at medium to low altitude at night, heavy defences are avoided where possible and the target is attacked from medium to low level with laser guided bombs. The USAF have openly conceded that the B-2 is detectable by high power low band VHF surveillance radars, therefore it follows that the less sophisticated F-117A will also be detectable by such systems. HF radar such as Jindalee or VHF radar such as many geriatric Soviet systems uses wavelengths comparable in size to the aircraft itself, hence the scattering mechanism which occurs (Rayleigh) is different and a solid return is seen. VHF radars are however generally considered to be inaccurate and very poor performers against low altitude targets of any kind, therefore the sanctuary of low altitude is clearly available to the stealth aircraft. In practical terms the ability of a low band radar to detect an inbound stealth aircraft may be of little real value, as the radar cannot be accurate enough to target anything but a nuclear armed SAM. SAM, AAM and fighter radars all operate in the upper G-J bands where they are effectively defeated by the stealth aircraft's unique capabilities. A stealth aircraft penetrating at low level can defeat VHF radar by terrain masking and all other radar with its airframe design. The use of the RHAW to detect threats at several times the detection range by the threat makes avoidance of radars a fairly straightforward exercise. Infrared search and track equipment is most effective at high altitudes under VFR conditions. Under typical night IFR conditions IR is relatively ineffective and is therefore never used by area defence weapon systems. 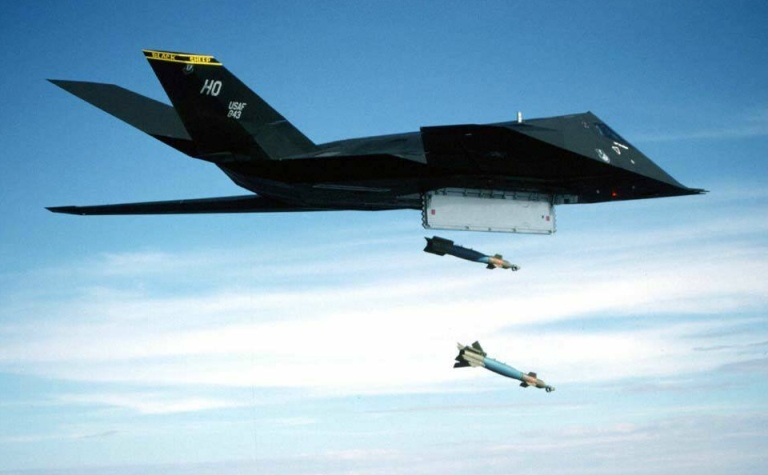 In a typical scenario the F-117A would avoid detection for as long as possible and only where the target was physically close to a radar would it expose itself during its run in to weapon release. At that point it would have the option of jamming which is most effective in comparison to the conventional situation. Once the target is hit the F-117A would egress the target area at low level again using its RHAW to keep out of the detection range of threat radars. Fighters with even capable lookdown-shootdown radars have very little chance of detecting the F-117A in ground clutter, given its inherently weak returns. The USAF's intention to integrate the F-117A into regular TAC operations suggests that it will spend much of its time flying defence suppression sorties to open corridors through hostile SAM belts, thus allowing conventional strike aircraft to penetrate. Used in concert with aircraft such as the EF-111A tacjammer and the F-4G Wild Weasel the F-117A is a potent asset. The ability to attack the C3 nodes of an air defence system just prior to a jammer supported strike paralyses the air defence system and thus most effectively dilutes concentration of fire . In perspective the F-117A is with all of its limitations a capable weapon system and a major milestone in tactical aircraft design. It reflects the current Western philosophy of defence penetration and illustrates clearly the basic principles behind stealthy designs. Many of the lessons learned in its design and development are evident in the newer B-2A and will no doubt be seen in the soon to be revealed A-12A Avenger. The question does remain, though, will tactical air ever be the same again ? Editor's Note 2005: subsequent disclosures during the Desert Storm campaign resolved the uncertainties about penetration altitudes - the aircraft prenetrated exclusively at medium altitudes, to stay above 'trash fire' - barrage AAA and smaller heetseeking SAMs, thus confining the threat to radar guided area defence SAMs which were most impaired by the low observable capability. To date the sole combat loss has been a single aircraft, downed by an SA-3 during the 1999 OAF campaign, making the F-117A the statistically most survivable combat aircraft ever flown.